In January, the International Rescue Committee launched its first-ever emergency fundraising appeal to support refugees exclusively in the U.S. In the charity’s 84-year history, funds have paid for the organization’s work as a whole, in the U.S. and abroad. But following President Donald Trump’s executive order banning refugees for 120 days — and Syrian refugees indefinitely — the IRC said it anticipated funding gaps to provide immediate aid for refugees on arrival and beyond, including housing, cultural orientation, health care, education, employment and immigration services. 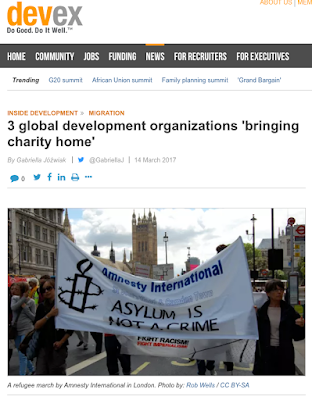 The case is one of a number in which recent international events have prompted global development and humanitarian organizations to begin delivering aid on home-turf, or fundraising specifically for domestic projects, for the first time. Read the full story on Devex.com. First of All congratulations to Simon Bishop for appointed as director of policy and programs at Plan International U.K. He is capable enough and I am sure he will be doing great with his new job.